• Tribology is derived from the Greek word “Tribos”. Meaning of Tribos is Rubbing. • Tribology is a science that deals with friction, lubrication and wear in all contacting pairs. • Tribological knowledge helps to improve service life, safety and reliability of interacting machine components; and yields substantial economic benefits. Example 1 is related pitting wear on the cam surface(as shown in Fig. 1). Cams are used to transmit rotary motion in reciprocating motion. These components are subjected to jerks in sliding distance, which leads to form some pits on the cam surface. 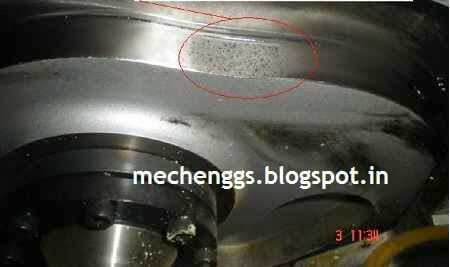 Creation of pits on cam surface increases noise pollution and reduces mechanical performance. Understanding the mechanism of pit formation helps to estimate the life of component and find methods to reduce such pitting failures. The following figures(Fig. 2 and Fig. 3) are examples of two journal bearing. Left hand side is photograph of centrally grooved engine journal bearing. It appears that bearing is worn out due to foreign particles. Right hand side is a photograph of an aluminum bearing subjected to heavy load, which causes shaft surface to run over bearing inner surface. In these examples of journal bearing, wear increases the clearance between shaft and bearing and leads to reduction in load support capacity of the bearing. Often such failures occur in absence of sufficient lubricant hydrodynamic film thickness due to relatively low speed. Learning tribology cultivates an understanding that at low speeds, the main purpose of oil is the lubrication and high viscosity oil will be preferred to low viscosity oil, while at high speeds the major purpose of oil is to act as a coolant and low viscosity lubricants are preferred to carry away frictional heat of operation. Here lubrication is a secondary consideration. Fig 4. Gear teeth removed from gear. A pit on the surface of gear tooth is shown in Fig. 4. The pit generally occurs due to excessive contact stress. Understanding the effect of contact stress helps in developing an equation for estimation of perspective gear life. Fig 5. Pits on gear teeth. 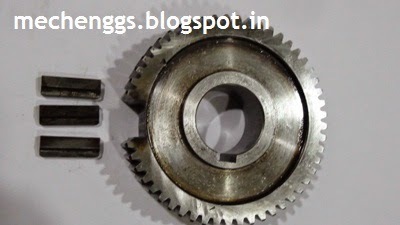 Studies of fluid film bearings, rolling element bearings, seals, gears, cams, and brakes are some of the applications in which tribology is required. Basic knowledge gained by Tribology course is very useful for industries related to power, steel, cement, oil etc. Practicing such knowledge in problems ranging from house hold appliances to large size ships earns great economic benefits. Therefore tribology course is often named as : “Industrial Tribology”, “Applied Tribology”. • Friction, wear and lubrication have been taught in many science and engineering classes at a rudimentary level. It means empirically derived trends (friction force is proportional to loading force, static friction is greater than kinetic friction, viscous friction in a fluid is proportional to the normal contact force, etc.) are often used as the only predictive tools available. These approaches have the drawbacks of being predictive only over a limited range of parameters. Since the under-laying physical mechanisms are not well understood, often one does not even know which are the important parameters or over what range the observed trends are valid. This poor predictive power has led the field of tribology being perceived in many scientific quarters. 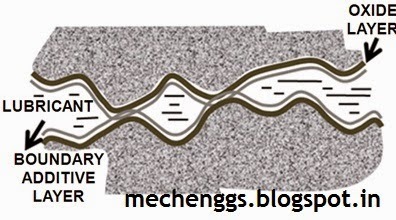 • Most tribological phenomena are inherently complicated and interconnected, making it necessary to understand the concepts of TRIBOLOGY in details. • Integration of knowledge from multifaceted disciplines(solid mechanics, fluid mechanics, material science, chemistry etc) is essential and therefore a separate subject is required. • Solid Mechanics: Focus is on expressions of contact stresses/deformations and surface temperatures due to rolling/sliding. Fig 6. Material science and chemistry. • Fluid Mechanics: Study of lubricant film formed between various geometric shapes of rolling/sliding surfaces. • Material Science: Focus is on atomic and micro scales mechanisms whereby solid surface degradation or alteration occurs during relative motion. • Chemistry: Deals with reactivity between lubricants and solid surfaces. • Thermodynamics: Heat and mass transfer in fluids and bounding solids.